Now I’m going to let you in on a secret. I saw that, wrote a post, published it, read it, was happy with the pithy bits I wrote, and was all set to leave it alone when I happened to hit refresh and saw the two together. I HADN’T MISSED ANYTHING. 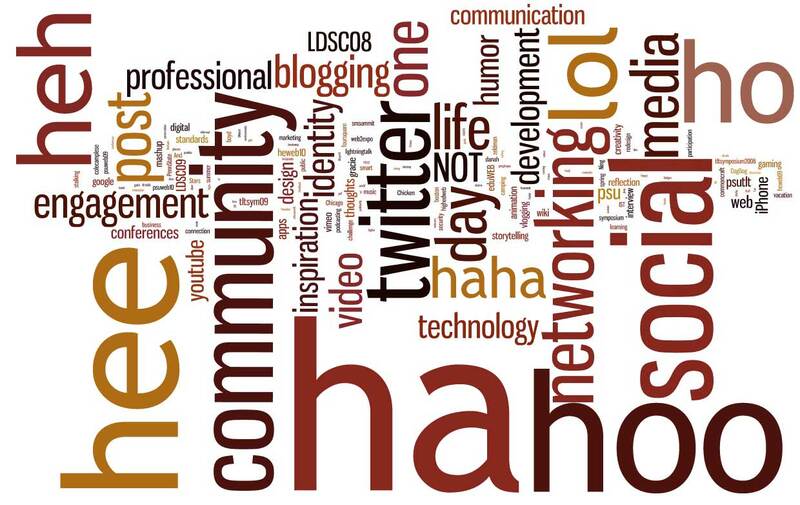 MR. PHOTOSHOP WAS UP IN MY WORDLE, PLAYIN’ WIT THE LULZ. Holy cow, I wish I’d caught that the first time around. But quite frankly, I was stressed out about presenting in front of a new and, potentially, more “serious” audience. I’ve never been to EDUCAUSE before, and certainly not to the national conference (my immediate impression is the same I had at last year’s Web 2.0 Expo in NYC: Huge. More vendors than attendees. Madhouse. But more later). If I was amused before, now I’m practically doubled over with laughter and snorting. Sometimes I still worry I don’t bring enough value to my work unit, but despite that (and my laughter), we’ve bonded and I feel like I belong. For better or worse, humor is really at the core of my being. I think the ability to laugh at ourselves is part of what makes us human and, as it turns out, probably why social networking-media-identity is where I’m at. I like being human (if flawed) and being able to see the humor of it all. And Dave? You got me good this time, my friend. Well played. Well played indeed. Heh. Ha. Hee. Ho. Hoo. LOL. 😀 But beware: I have another screaming monkey to bring back with me. Mwahahahaha! OMGWTFBBQ where in the hell is OMGWTFBBQ?